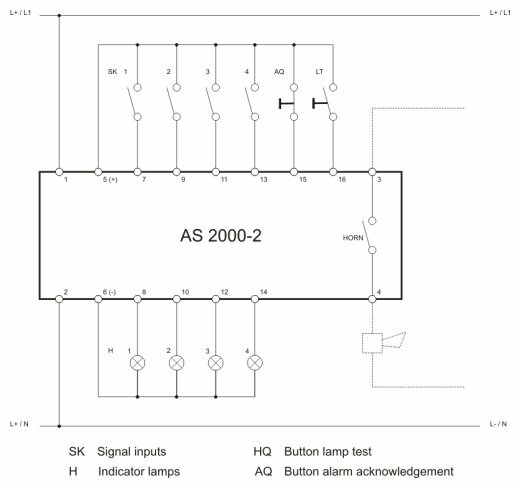 The AS 2000-2 - the practical alarm monitoring unit for 4 alarm circuits with operating current inputs- neatly houses flasher, horn relay, lamp control unit and the necessary power supply unit for 230V operation within a single enclosure. Incoming alerts are indicated visually via a flashing light, acoustically using a horn. All operating and alarm units are monitored externally.The units can be connected using low-voltage cables since AS 2000-2 works with 24V/48V. The 230V version generates an internal voltage of 24V. The AS 2000-2 can also be used as a composite fault monitoring system in partnership with the AS 1000 and AS 2000-1 fault monitoring systems. This increases the number of monitored lines many times over. When an alarm contact closes, a relay integrated in the AS 2000-2 energizes, whereupon the flasher starts, and the horn relay switches into self-holding operation. The assigned alarm lamp begins to flash and the horn sounds. Pressing the acknowledgement button (AQ) shuts off the horn and switches the alarm lamp from flashing to steady operation. The lamp will extinguish once the fault has been removed. 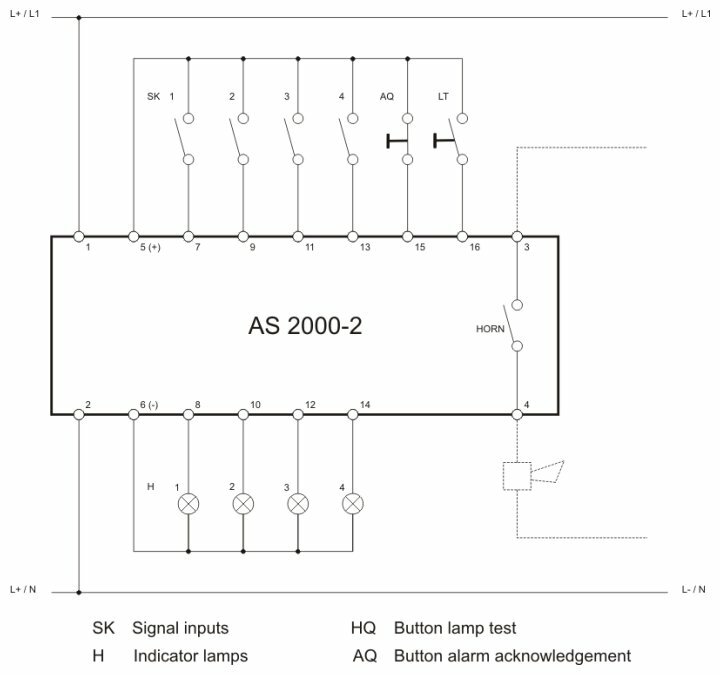 In the 230V version, the alarm contacts are supplied with low-voltage from the system. These conditionally potential-free contacts mean low-voltage cables can be used for the connections. Pulse-type alarms are stored (horn and flashing light), and return to their idle state once acknowledged. The flash frequency of the alarm lamps can be adjusted to 0.5, 2 or 8Hz by replugging them on the PCB. The factory setting is 2Hz.